When the Partnership for Haddonfield was first established, their web presence was part of the old Business Association/Boro combined site. Later various teams came up with ideas for a Shopping site, a Professional site, a Bridal site and a First Friday site. Raphael Webscapes had a vision for simplifying and unifying the sites. The plan would ultimately be a cost saver since the site could be updated by a staff member. After winning the opportunity to build the site from a host of bidders, the first thing we thing we did was re-brand with a new domain name and logo. 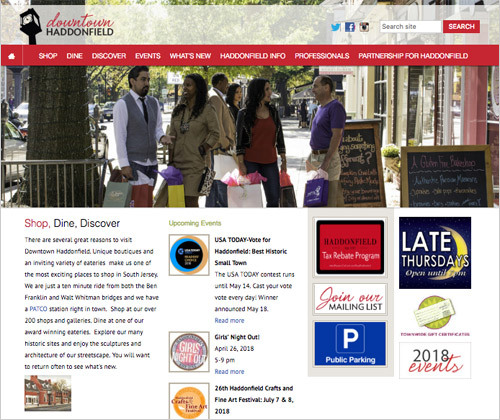 The downtownhaddonfield.com logo is now used for Social networking and e-blasts, as well as the website. The new website has an improved, search friendly database that can be used to find a restaurant, a professional, or a retailer. 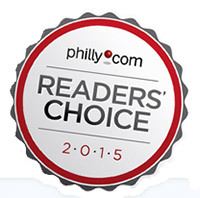 Haddonfield news and events, as well as Partnership business pages are also featured. Our cameras have been busy taking photographs to show off the beauty of the town in a series of rotating galleries. Voila! 2108 Update: Stay tuned! We are in the process of developing an updated website with even better visuals and a vertical design element. Events and Downtown activities will be easier to find and our merchant pages will contain more information.